Boatersland Marine makes it easy to buy the individual replacement parts you need to repair your Raritan marine toilet, such as the Raritan CH25 front cover with O ring shown here. You have the option of buying complete repair kits or separate parts for your Raritan marine head, depending on your needs, and Boatersland Marine sells them at discount prices and ships them swiftly to your door, so you can get back on the water while saving time and money. 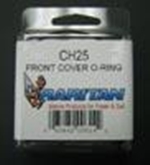 The Raritan CH25 Front Cover With O Ring is an easy replacement and is available along with a range of other Raritan parts so you can keep the Raritan marine toilet on your boat working properly. Count on the quality of Raritan and the service and low prices at Boatersland Marine.